The first Doverodde Book Arts Festival took place May 8-10th, 2009 and hosted several events: an international themed exhibition: Ø / Island, a special exhibition with Danish artist Mogens Otto Nielsen, talks, workshops, demonstrations and stand areas where the artists could show, sell and discuss their work with visitors. The Reading Corner was established for visitors to browse through the Center's new small book arts collection and a Book Café – designed for the occasion by puppet maker and set designer Lena Hansen – was likewise introduced. 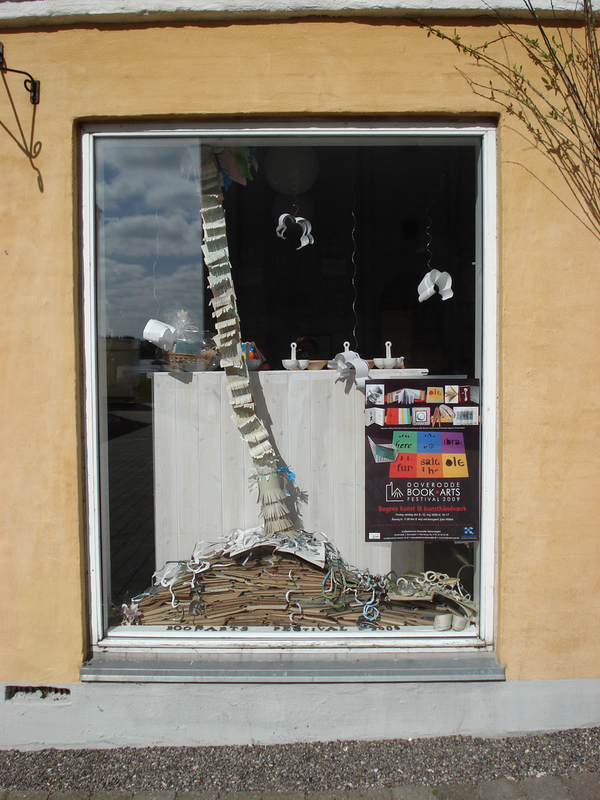 Local wood sculptor from Mors, Tage Pedersen also delivered the permanent outdoors sculpture: Book Art. The Festival was opened by the guest of honour, Jytte Hilden, former Danish Minister of Cultural Affairs and cultural consultant at the Royal Library, Copenhagen and the chairman of the board of the Limfjordscentret, Arne Hyldal, accompanied by the music trio: Morgentau from Kassel, Germany. Karin Nikolaus, Centre Director & Liz Hempel-Jørgensen, Project Coordinator photo by Karsten Bundgaard, 2009. In the afternoon Sarah Bodman from the University of West England, Bristol gave her talk: Artists’ Books Around the World in the 21st Century. Talk: Artists’ Books Around the World in the 21st Century – Doverodde Book Arts Festival, Denmark, Friday 8th May 2009. View slideshow and download handout as PDF. In the evening Peter Zeeberg, Ph.D. senior researcher at the Society of Danish Language and Literature gave his talk: Tycho Brahe –his books and his island, accompanied by music from the Renaissance by Morgentau. On the Saturday May 9th Tom Sowden from the University of West England, Bristol – colleague of Sarah Bodman – gave his talk: Artists’ Books in the Digital Age. and download handout as PDF. In the evening Marianne Josefsen the Storyteller Lady told stories to young and old, accompanied by folk music by Morgentau. On the Sunday May 10th bookbinder and artist Monika Langwe, Sweden gave her talk: Limp Bindings from Tallinn. During the course of the 3 days several workshops and demonstrations took place. Here pictures from some of them. Simple Bookbinding and Decoupage Workshop with bookbinders, Marianne Lund Petersen and Anni Bentsen. Marbled Papers Workshop with bookbinder, Martin Degn Pedersen. Origami Workshop with graphic designer, Gert Hansen. Beginners Pop-Up Workshop with graphic designer and book artist Mette-Sofie D. Ambeck. 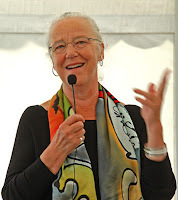 Calligraphy Demonstration by calligrapher, Birgitte Hansen. The Bookbinding evening class at Holstebro Activity Center had set up their own workshop area where they demonstrated how to mend old worn books using traditional equipment and demonstrating techniques of the old craft. The Bookbinding class from Holstebro working, 2009. Photo KEH-J. A separate exhibition of the artists’ book and book objects by Danish artist Mogens Otto Nielsen was on display from May 8- June X. During the Festival he was present himself. Mogens has among other art forms worked with Mail Art since 1974. Learn more about him and his work on Atmosphere Controlled. Sarah Bodman and Tom Sowden made a collaborative book (partly en route) for the Ø (island) exhibition at Doverodde Book Arts Festival, which is now in the collection of the Doverodde Book Arts Center at Limfjordscentret. –an artists' book on its way to Doverodde! –can also be seen on the UWE site here.